After about 40 days of growing, the African penguin chick is fully developed and ready to hatch. The action of a chick breaking out of its shell is called pipping. As the chick gets ready to hatch, we will check it closely to see for the first signs of a pip. Initially it will look like a tiny crack or raised spot on the shell. The chick continues to make that hole bigger and bigger (the parents will also help the process along) until it is out of the shell completely. Check out this video of the pipping process. You will see how we remove the egg from under the protective parent to check on the chick's progression as it breaks out of the shell. Listen closely to hear the chick peeping from inside the shell! 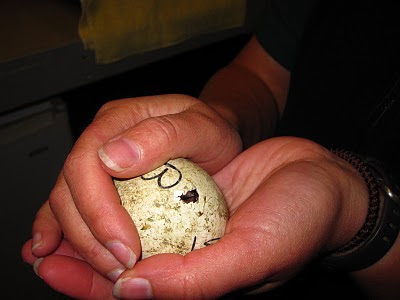 Once we see that everything is progressing normally, the egg goes right back to the parents.